Human vision and cognition have evolved over millions of years into an incredibly powerful system that enables us to actively seek the information we need to make sense of and interact with all aspects of the world around us. Despite the complexity and sophistication of the processes involved, vision and cognition are processes that we carry out quickly, continuously and with no conscious effort. Whilst computer systems have been developed that can beat any human at chess, no computer can come close to humans when it comes to visual cognition. Why this is so becomes clear when we realise that around 50% of the cortex of the brain is devoted to vision, 40% to the other senses and controlling motion, leaving less than 10% for all other processes such as conscious thought, including playing chess. Attempts to improve the efficiency of interpretative tasks through automation deliberately ignore or sideline the enormous processing power within the human brain. 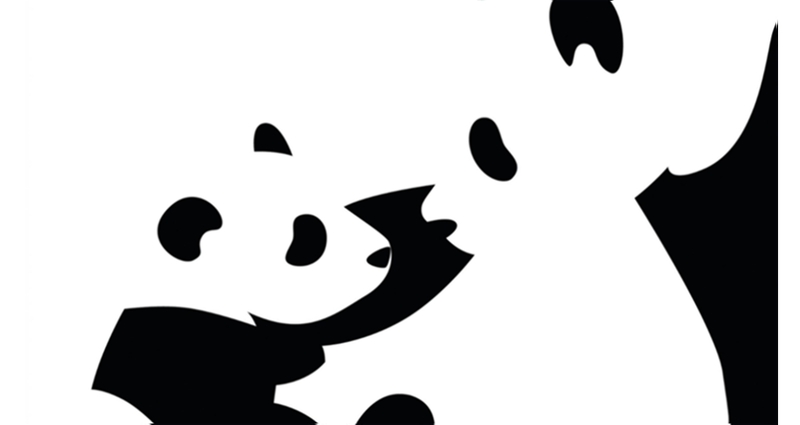 Human visual cognition can recognise this picture as representing a panda and her cub even though there are no ‘panda shaped’ elements in it. We can go further and make a reasonable estimate of the outline of the pandas’ heads, again despite there being no boundary to track. This is of immense importance to the seismic interpretation segment of the E & P workflow, where we are currently both drowning in data and going through a major demographic shift. The latter means that in a very small number of years the industry will be reliant on a new generation of interpreters with expectations of computer technology which are simply not met by standard interpretation platforms. 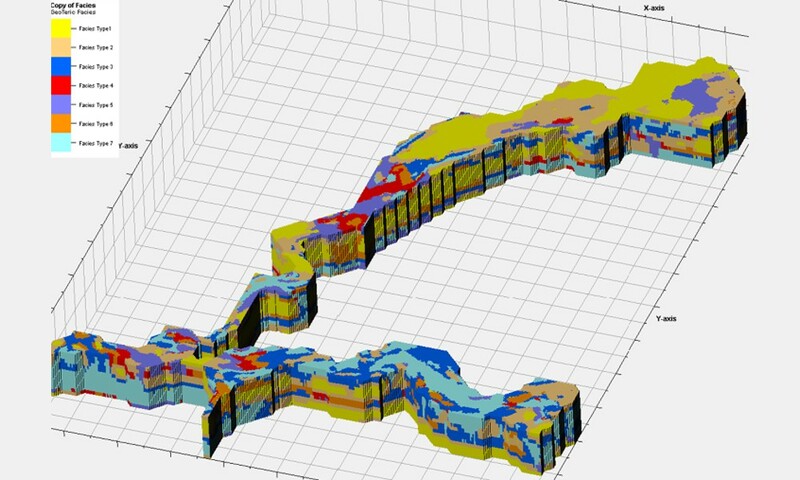 At the same time the imperative to get more from the major investment that has been made in 3D seismic data to better understand and characterise risk, develop new plays and improve recovery from existing fields has never been greater. What this means is that we need technologies that empower our geoscientists to work through the ‘Data, Information, Knowledge’ hierarchy and, therefore, be able to contribute to decision-making processes much more efficiently. In the 1990s a number of 3D visualisation systems came to the market with the intent of replacing the traditional 2D seismic ‘wiggle picking’. These systems represented a great leap forward in the tools that were available for understanding seismic data, but essentially they were ‘just’ visualisation systems. 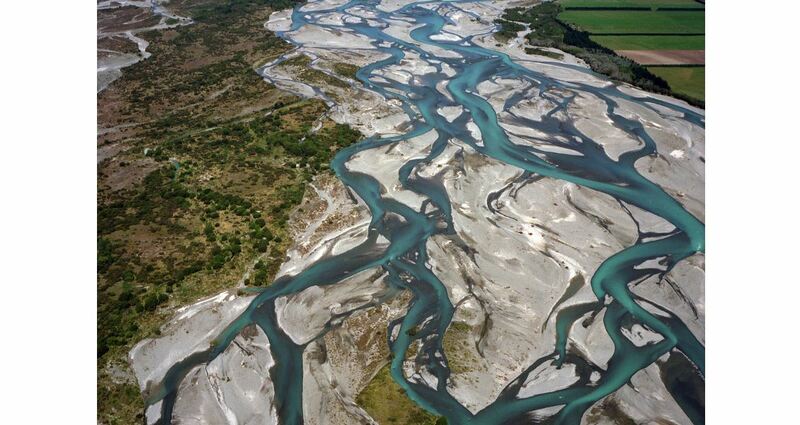 It is now recognised that a new, cognition-based approach to seismic interpretation is needed. Hence Cognitive Interpretation – the bringing together of advanced interpretative processing techniques and the power of human visual cognition. Whilst being complementary to conventional interpretation, Cognitive Interpretation turns the interpretation process on its head. 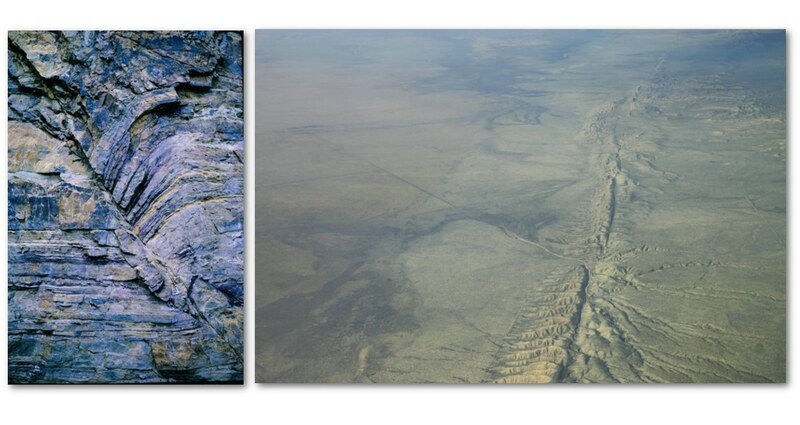 Conventional interpretation is centred on picking horizons and faults to reveal the imaged geology, whereas Cognitive Interpretation is based on revealing the geology ahead of defining the important structural and stratigraphic elements. This process reversal makes a significant contribution to the productivity gains that can be achieved with this method. Creating a Cognitive Interpretation system is fundamentally different to the traditional visualisation systems and is non-trivial, as it requires the design of the system to be determined by human rather than technological factors. This includes an understanding of when it is most effective to rely on the human visual system, when to pass control to the computer and how the two components should interact. Cognitive Interpretation is only achieved in a system that combines high resolution, multi-component visualisation, advanced seismic attributes, interactive 3D object delineation and manipulation and interactive multi-attribute data analysis tools in exactly the right way. To achieve this, Cognitive Interpretation must draw on research from many disciplines, including anatomy, biology, ergonomics, neurophysiology, ophthalmology, physics and psychology, some of which are rarely if ever considered in the design of oil and gas technology, and connect this with expertise in mathematics, geophysics, geology and software engineering. A very important consideration for Cognitive Interpretation is that the human visual system is much more sensitive to temporal or spatial change than the absolute intensity of an image. This manifests itself in how strongly the eye is drawn to motion, but we also see a much greater neural response when the eye travels over an edge in an image than when we look at areas of constant intensity. However, we cannot assimilate information in a scene if things change too quickly – but we also lose the ability to assess change if there are significant time delays between being presented with different scenes. In addition, our visual attention can be distracted by having to look elsewhere, e.g. at a computer keyboard or GUI item. What this means is that information needs to be presented to the interpreter at the speed at which they think and it must be possible for the interpreter to interact with the data in ways that minimise upsetting their thought process. It must also be possible to create and review multiple realisations at each stage of the workflow. The ideal Cognitive Interpretation system is one in which ‘… one is ignorant of the working of most of the parts – the better they work the less we are conscious of them…’ (Kenneth Craik; The Nature of Explanation, 1943). When we see geological features in nature we make many inferences based on our training and experience, which give us an understanding beyond what can be obtained from the information explicitly captured in the image. Seismic data is an abstract representation of the geology, which complicates the process of making expert inferences and leads to greater uncertainty in our geological ‘diagnosis’. A major step towards making Cognitive Interpretation possible is the use of Red-Green-Blue (RGB) colour blending of seismic attributes. 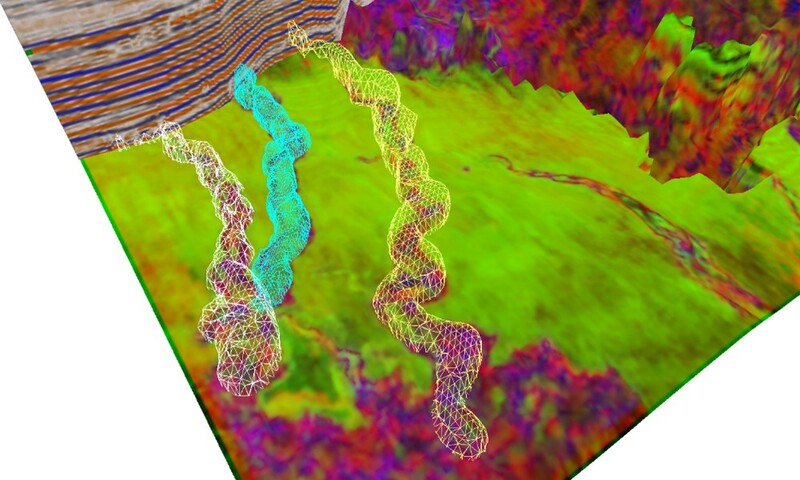 This technique can convert 3D volumes of seismic ‘wiggles’ into geological images extremely quickly. RGB colour blending is effective because it reflects the way our visual system works and therefore allows information to be presented to the human visual system in a cognitively intuitive way. We perceive colour because we have three types of cone cells, which have their maximum response in (approximately) the red, green and blue segments of the electromagnetic spectrum. If we just had one type of cone cell all we would perceive are shades of grey no matter what wavelength of light the cell was most sensitive to. This would be very limiting as we can perceive around 10,000,000 colours but only 500 shades of grey. The use of full colour RGB images (or their inverse Cyan-Magenta-Yellow), based on a palette containing thousands of colours, is at the heart of Cognitive Interpretation. 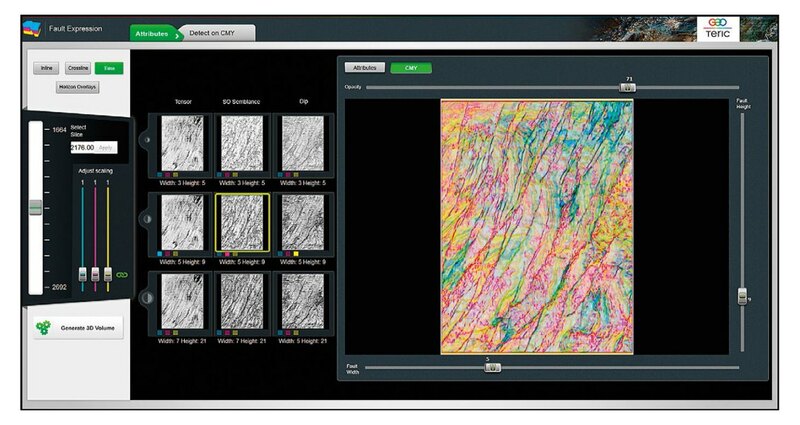 Used correctly, full colour displays allow us to encode and comprehend much more information from a single image than using greyscale, spectrum or other 1D colour palettes. As a consequence, and perhaps counter-intuitively, images become easier to comprehend when we use RGB-based ‘Explicit Encoding’ to increase the amount of information in an image. Knowledge and insight arise from understanding relationships between different pieces of information more than from examining pieces of information in isolation. In addition to explicit encoding, there are two other data comparison methods important to Cognitive Interpretation: superposition and juxtaposition. With an understanding of vision it is possible to select when to use these techniques, and very importantly, how they are implemented, so that we are always presenting information in a cognitively intuitive manner. At the heart of GeoTeric is a (patent pending) ‘Example Driven Framework’. This uses superposition, juxtaposition and explicit encoding to support a set of interactive, cognitively intuitive workflows, which allow the interpreter to optimise results and examine different data analysis options in an order of magnitude more quickly than was possible previously. Using tools that are designed in a cognitively intuitive manner increase the efficiency of your work and enable you to harness your cognitive capabilities for a more focused interpretation. Speed is only one of the benefits of Cognitive Interpretation. The full upside from leveraging cognition in seismic interpretation arises from the ability of the human visual system to recognise and classify features from incomplete and ambiguous data. Vision is an inherently multi-scale process, which automatically bases local inferences on a whole scene context and links these with world-knowledge and heuristics. For example, we can easily recognise something as a house even if it is largely obscured by trees and we have never seen that particular house before. This is hugely important for oil and gas exploration and production due to the immense geological variability and complexity that need to be understood when using a primary data source (3D seismic) which gives a non-unique and incomplete view of the subsurface. The way that the human visual system recognises and reconstructs objects is still very poorly understood, but human observers will outperform any computer system when it comes to recognising and classifying objects that we have never seen before, even when they are obscured, poorly illuminated or distorted. At the same time, the human observer performs very poorly when it comes to comparing absolute values in an image and we see enormous inter-observer differences for tasks involving definition of the boundaries in images. However, the human observer can construct a reasonable representation of an object even where there are enormous gaps in the image representation of that object. So again, Cognitive Interpretation systems must be configured to create an optimal balance between the data-driven and expert-guided aspects of the interpretation process. Cognitive Interpretation solves a major problem faced by the industry today with a win-win solution. It enables a more thorough examination of the information obtained in the available seismic data by more effectively utilising the skills of geologists involved in seismic interpretation. 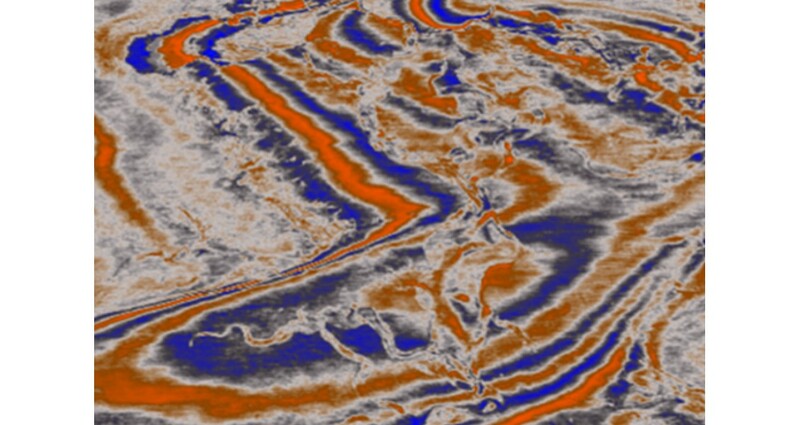 This increases the likelihood that a seismic interpretation is an accurate reflection of the imaged geology and allows a deterministic assessment of reservoir heterogeneity to be built into 3D geological models. The end result of Cognitive Interpretation is a huge increase in interpretation productivity, which allows improved volumetric estimation, better informed well planning and therefore a more confident assessment of field economics. As the cableless seismic market grows it appears that the most flexible systems will be the winners.